These are questions that are often asked when it is learned that a revaluation is to be undertaken in a municipality. An understanding of why a revaluation is undertaken; how it will be accomplished; and what does an increase in assessments mean are questions that should be addressed. Many misconceptions associated with a revaluation can be dispelled if taxpayers are properly informed. Sound assessment administration depends on the understanding and support of a revaluation program. WHY IS THERE A NEED FOR A REVALUATION? 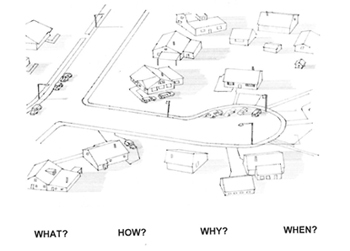 a. changes is characteristics in areas or neighborhoods within the municipality and within individual properties. WHAT HAS TO BE DONE DURING A REVALUATION PROGRAM? Both the interior and exterior of each property are usually physically inspected, and building dimensions are noted during the revaluation process. In addition, recent sales of properties are studied and may be adjusted to estimate the value of property that has not been sold. Property typically purchased for investment purposes is analyzed in terms of its income-producing capability. In short, all information believed to have an influence on value will be gathered, reviewed and analyzed in order to make a proper determination of each property’s full and fair value. Although revaluation will result in an increase of nearly each individual assessment, it does not mean that all property taxes will increase. You might now be thinking , “How can my assessment increase and my taxes not go up?” Remember, assessments are merely a base used to apportion the tax burden. The tax burden is the amount that your municipality must raise for the operation of county and local government and support of the school system. To illustrate, let us assume that the amount a municipality must raise from property taxes is $15 million. The total of all assessments in that municipality is $600 million. In this example, a municipality would have a tax rate of $2.50 for each hundred dollars of assessed value. The property in our example is over assessed although the assessment is $119,040 less than the property’s true value. The ratio of aggregate assessments to the aggregate true value of all real property in the municipality is 50 percent. The ratio of our individual property is 70%. ($277,760 / $396,800). Applying the .0125 ($1.25 per $100 of assessed value) tax rate to our property, which would now be assessed at its true value of $396,800, would mean a decrease in taxes as a result of all assessments based on the true value standard. True value assessments, the goal of a revaluation program, would have decreased the taxes for the property owner in our example by $1,984. This is based on assumptions within the same tax year. An actual tax rate, however, cannot be determined with any certainty until the new assessments are filed and operating costs for schools, county and local government are fixed. (Budgets are not completed until several months after the date for filing a tax list.) Although a tax rate cannot be calculated until budget requirements are determined, one thing is certain regarding the taxpayer in our example. He will continue to pay more than his fair share of the property tax burden if a revaluation is not undertaken. An increased budget amount (from $15 million to $21 million) coupled with true value assessments results in no tax increase for the property owner in our example. WHAT IS EXPECTED OF PROPERTY OWNERS? A prospective buyer would not be expected to purchase a property without first making a careful inspection. Similarly, an individual ordering an appraisal expects that a thorough inspection will be made before a market value estimate of the property is rendered. Equitable revaluation depends on the cooperation of taxpayers. Property owners have a stake in the outcome of the revaluation program. Interior inspections, especially, require that residents cooperate with the property listers. The validity of the market value estimate depends on the collection of accurate data. Any assistance a taxpayer can provide will aid greatly in the total data collection process. The municipality and the company assisting in the program will make every effort to cause taxpayers the least possible inconvenience. Remember, the people making the inspections are not necessarily responsible for developing the market value estimate. Their job at the time an inspection is being made is not to make an instant judgment as to valuation but rather to collect pertinent information to be used in the valuation process. Examples include the number of bathrooms; verifying measurements; interior fin ishes; and the observed condition of the property to determine effective age. WILL TAXPAYERS BE INFORMED OF THEIR PROPOSED ASSESSMENT? The revaluation firm is required to mail each taxpayer a notice advising him of the new appraised value prior to the new value being officially listed on a tax list. This usually occurs after November 10 and prior to December 31. WHAT IF A TAXPAYER IS DISSATISFIED WITH THE PROPOSED ASSESSMENT? The notice that includes the appraised value will also explain how to arrange for a personal informal hearing to review the proposed assessment. A taxpayer planning to attend the review should be prepared to support any disagreement regarding the appraised value of his property. For example, recent sales of similar or comparable properties are an indication of value. A recent purchase price of the property may also help to support a view as to value. Also, the cost of recently constructed comparable buildings could support a belief of fair market value. The taxpayer will also want to verify such things as the square footage of the property, the number of bathrooms, attached porches, decks, garages, etc. The assessor will file the new tax list with the County Board of Taxation on January 10 of the tax year. If the matter of valuation is not resolved prior to filing and certification of the tax list, an appeal may be filed with the County Board of Taxation on or before April 1 or 45 days after Notice of Assessments are mailed, whichever is later. In a taxing district where a municipal-wide revaluation or municipal-wide reassessment has been implemented, a taxpayer or taxing district may appeal on or before May 1 to the County Board of Taxation by filing with it a petition of appeal or, if the assessed valuation of the property subject to the appeal exceeds $1 ,000,000 by filing a complaint directly with the State Tax Court. If the taxpayer is not satisfied by the decision of the County Board of Taxation, an appeal may be filed within 45 days of the County Board judgment to the New Jersey State Tax Court.